Bulky desktop computers are getting less and less popular every year. Nobody wants to have a huge case and a power-hungry PC in the house anymore, unless they need such a power-horse for work or leisure (gaming). Many of those owning a desktop 5 years ago are now laptop users, but if they need a decently powerful computer that won’t be carried around and will be used for everyday and multimedia activities, nettops are right now the best choice they can make. In this post you’ll learn what is a nettop, what are they best for and what are the best options for such devices available right now. Read the next paragraphs for more details. So, what is a nettop? It’s a mini desktop computer usually no bigger than a standard book, powerful enough to run all your daily tasks and also all kinds of multimedia content modern society offers, while being affordable. Most of the time it comes with wireless connectivity and can be mounted on the back of a display or a LCD/plasma TV, becoming almost invisible. You can easily control the nettop via a remote or with a set of wireless keyboard+mouse. Many already own a mini nettop PC and more are leaning towards them everyday. But, while they are perfect for a standard computer in case you don’t have too many expectations (browsing and streaming online content, editing documents, watching HD movies, photos, chatting, listening to music, etc), most buyers use them as computers for kids or as HTPCs (Home Theater PCs). HPTCs are devices meant to store and output content on a bigger display. They are suitable for playing self-stored content, for streaming it from online sources, for accessing the Internet directly on your TV (if it comes with such feature) or for recording and storing your favorite shows so you can enjoy them later (just like a TiVO). Now that we know what is a nettop, I’m going to tell you what are the best devices in this class right now. This is not a top, each of the PCs listed in here are good, but they come with different features and fall within different price ranges. They’ve been selected based on my experience with them, reviews from expert sources and opinions from the regular users who bought them and shared their reviews on big websites and forums. I’ve divided these mini computers in two different categories: barebones and full working nettops and you can read about both these classes below. Barebones are computers without memory, storage drives and an OS. They’ve got all the other things except for these and that’s because you’ll be able to choose the memory and the HDD/SSD and put them in there yourself, thus saving money (if you already own these for instance) or getting to easier customize your computer to your own liking. If that’s not what you want, scroll down to the second part of this post were we speak about fully functional mini PCs. 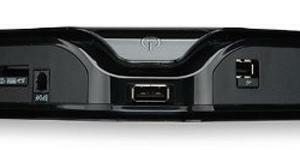 Zotac Mag Zbox barebone – comes with an Atom D525 dual-core processor clocked at 1.8 GHz and Nividia ION 2 . You also get all the standard goodies, including 7.1 sound card, HDMI and DVI output , 6 USB slots, Wireless N, Gigabit Lan . So basically everything you’d need for a powerful HTPC, as long as you’ll add at least 4 GBs of RAM and a proper HDD (or maybe an SSD). Prices are also quite good, going for about $250, but Amazon actually has it a bit cheaper online. Zotac Mag SFF Fusion barebone – the SFF Fusion is pretty much the same barebone as the one above, but it packs an AMD Fusion E350 APU, which is going to be a bit slower than the Atom + ION combo above, but less energy hungry and also about 15% cheaper. Shuttle XS35V2 barebone– if you don’t really need the graphics and look for a cheaper barebone for basic everyday tasks, this could be the one. It packs the same Atom D525 processor, but no discrete graphics. It offers 4 USB 2.0 slots, Fast Ethernet 10/100, Wireless N and mic/headphone jacks, plus VGA video output (no HDMI or DVI, so no way to digitally output video content). The entire barebone is fanless (so noise free) and requires very little power to do its job. Of course, compared to the Zotac barebone above, this one is significantly cheaper as well. All the listed solutions are great for some small and non-intrusive computers. 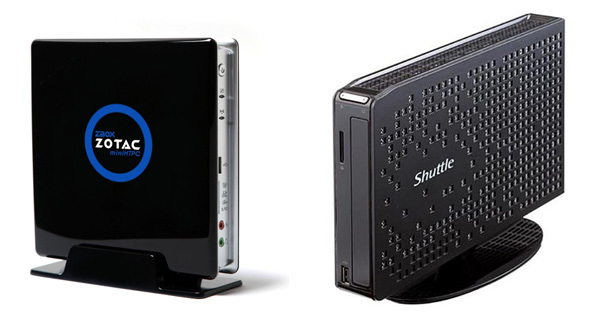 The Zotacs packs a more complete offer, while the Shuttle is fanless and cheaper. Also, you should know there’s a bright blue LED on the Zotac machines and it can be bothering unless you’re planing to hide your device behind a big screen TV. And remember, these are not fully working computers, as they lack memory, storage drives and an OS. If you’re looking for the complete solutions you can just take out of the box and start using, see the rest of the article after the picture below. Here are the actual nettops, with everything they need inside the case. Some come with mouse and keyboard included, some don’t. Still, you get a bunch of different options to choose from, based on your performance requirements, features needed and available budget. All of course highly recommended products with good reviews from regular users and tech journalists. Based on reviews and marks received, if you want an affordable small computer right now, the Acer AspireRevo R3700 should be on of your top picks for the money. It comes with powerful Intel Atom D525 processor and latest generation Nvidia ION graphics, 2 GB of memory, 250 GB hard-drive and Windows 7 Home Premium OS. In terms of connectivity, you get both Wireless N and Gigabit Ethernet LAN. As for ports, there’s pretty much all you’ll need, with 6 USBs, HDMI and VGA, headphone and SPDIF optical audio and card-reader. Plus, you get a wireless keyboard and a mouse and the nettop can be mounted on your desk with the little foot provided, or behind a screen, as it is VESA compatible. All in all, will be able to play any type of content on this one, including self-stored 1080P and streamed HD clips from Youtube, Netflix or Hulu. Plus you can connect it to your local network and Internet and use it as a HTPC for your living room entertainment system. The only important features you could miss are an USB 3.0 port and an optical unit (can connect an external DVD or Blu-ray one via USB), but what you get is enough for most users. More details about this Aspire Revo are available in this other post here on the site. Price tag is set at about 250 bucks, but once again Amazon lists it slightly discounted, on their website, next to some extra pics and reviews from those who already bought it. 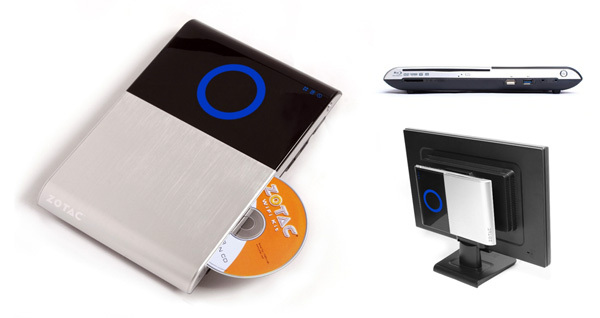 Zotac Zbox unit with Intel Atom D525 1.83 GHz processor and Nvidia ION, plus 2 GB of memory, 250 GB storage and a Blu-ray reader optical unit. More details here. Zotac Zbox unit with AMD Zacate E-350 APU hardware and Blu-ray. Details here. Both go for around 400 bucks right now, as I put together this post, but prices change with time. Click the links next to each model for more information, pictures, reviews from users and the option to buy one of those yourself. You have to know that these Zotac Zbox units are a little bulkier than other nettops in this top, but that’s because they come with included optical units. You’ll notice the fancy design and that the blue LED light on the body can be turned OFF by unchecking an option in BIOS, unlike on previous generation Zbox devices. 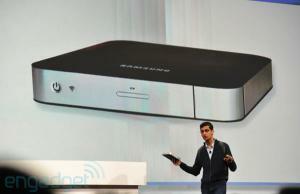 You also get latest generation features, like eSata III and USB 3.0 ports. Both the Atom D525 and the Zacate e-350 units will be able to deal with any type of content you might throw at them, with the Intel platform being a little bit more powerful. Asus couldn’t be left out of this list. This EEEBox EB1501P is right now their best nettop in terms of features, managing to out-beat all the other devices presented above. But it comes with an appropriate price also. There’s a dual-core Atom D525 processor inside this one and Nvidia ION graphics, plus 2 GB of RAM (single module) and 320 GB storage space. 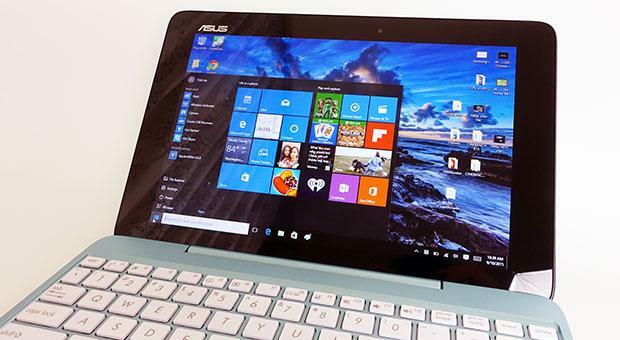 Wi-Fi N connectivity and USB 3.0 slots are present as well, alongside the Windows 7 Home Premium OS. And, unlike any other nettop in here, you get an internal DVD-RW optical unit on this one. As accessories, you get the standard wireless keyboard/mouse (slightly more comfortable than the ones of the Acer), the VESA mounting system and a remote control. As for build quality and looks, it’s pretty obvious this Asus is way better looking than most of the other devices above, with its metallic curvy chase and premium design. Of course, if you don’t want it on your desk, you can easily mount it behind the display via the VESA system. The EEE Box is a bit expensive though, especially since it does not offer a Blu-ray optical unit, like the Zbox nettop above does, while all the other features are pretty much on par. So it looks like Asus is asking us to pay extra for the looks and build quality. You might argue that the Mac Mini is not really a nettop and shouldn’t be included in here, but if you’re looking for a powerful and compact computer, this is also an option you have to consider if you don’t mind spending $600+ for it. Yes, this is a Mac and it ain’t cheap. 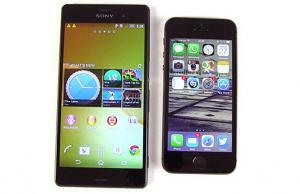 But it is incredibly solid built and offers good hardware and features in a tiny body. Pictures speak for themselves on the looks and the device measures 7.7 x 7.7 x 1.4 inches and weighs just 2.7 pounds. The case is of course a solid lump of aluminum. Inside there’s a latest generation Core i5 processor, 2 GB of memory and 500 GB storage space. While the above mini computers can act as light PCs and worthy HTPCs, this one is capable of more and can perform as an everyday computer for most of you, being able to handle heavy multitasking and even photo or video editors, especially if you’ll add a bit extra memory. On the back you get 4 USB 2.0 slots, FireWire 800 port, card-reader, Thunderbolt and HDMI output. And there’s also Wireless N, Gigabit LAN and Bluetooth, but the latest Apple Mac Mini no longer features an optical unit. Prices start at $599 for the Mac Mini described above, but you can usually find it slightly discounted online. Faster configurations are available as well, with a more powerful processor, extra memory and dedicated AMD graphics. You might say that is expensive, but if you’ll actually take a look at the specs and features and consider you get all these in a tiny box, you’ll conclude that the Mac Mini is a great device. Reviews and marks from buyers and experts also stand as proof of that. That’s about it with our list of best nettops and small computers of the moment. You can see that we’ve added a bunch of options that should meet the expectations and budget of most of you guys reading this post. If you want to save some money and already got parts at home, you can pick a barebone. 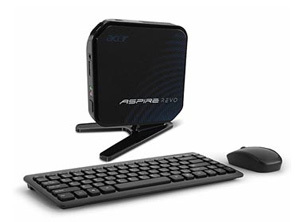 The AspireREvo AR3700 is the perfect option if you want a HTPC for your home and don’t want to spend a fortune on it. The Zotac Zboxes and the Asus EEE Boxes are complete nettops with optical units and latest generation features, but prices rise to around 400 bucks. Last but not least, if you want a compact computer for more than just video streaming/playing and plan to spend $500+ on it, the Apple Mac Mini is a powerful and worthy option as well. Of course, things change fast in this field, thus I’ll update this post as soon as new interesting products get in stores. Hopefully, my post was useful and helped you learn more about these nettop mini computers, in order to decide whether they are what you’re looking for or not. Of course, you can always ask for help via a comment if you have questions or care for more details on some aspects. Excellent review and comparisons. Helps buyers make a very informed purchasing decision. Many thanks! Very good review. Thank you! I was thinking on buying a Mac Mini but I am now considering a nettop. I have a lenovo nettop on my big screen TV and love it. I paired it with a Rii keyboard. I spent about $400 for everything. Love it! I am a huge Asus fan (love my netbook), but please note the EEEbox 1501 no longer can be found with “optional” keyboard or mouse or remote. Given its high price, I think Asus is making a mistake in dropping the accessories. Am now looking seriously at the Acer Revo AR3610. Whoa, Dell Zino’s RAM goes as high as 8MB, and DVD drive included. Though price is high, one can knock off a couple hundred dollars through the Dell Outlet. Will let you know how it works out if I buy one – checking all features against other nettops. Lenovo Q150 would be a great model as price and quality. Weird thing, they’ve just taken out from the market. Very stupid! 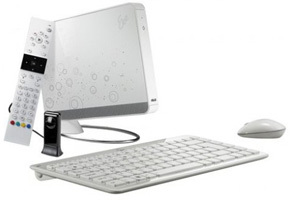 I think the future of desktops is called net-top/mini-top (not all-in-one-s other lookalikes). Followup to my previous comment: Hurrah – I did buy a Dell Zino HD with the wireless option, built-in DVD RW drive, and 4GB RAM. I chose one from the outlet for $359 total, incl shipping & 10% off coupon (found online). My only advice when buying from the Dell outlet is to check the features carefully, especially for amount of RAM (need at least 4GB) and for wireless capability. (Ironically am using an Ethernet RJ45 cable, as the router happens to be close to the TV, but wanted the wireless option in case circumstances change. Did not test wireless.) Am using an HDMI cable between the HDTV and the PC. Note also the outlet has both the 400 model and the newer 410 model – I got the 400 – absolutely satisfied. I set it up with large icons, typesize at largest, and IE typesize at largest, so that I can read everything from 14 feet away. This is a fabulous nettop PC – absolutely perfect reception on all streaming including Netflix. Can’t wait for the next tennis grand-slam, ditto British golf, etc. For a PC remote, I recommend the EZ Commander with trackball from Amazon, using the latest install sw available at ezcommander.com. Also have on order a wireless keyboard from Amazon, the IOGEAR model GKM581R. Note, I did not buy the remote & KB from Dell, as they got mixed reviews, and there is some concern about how many feet they reach. Last tip: make sure your HDTV has its upscaling feature turned on, so you are getting the sharpest possible picture when streaming non-HD. Great post as always.I think that somedy it’ll be thin like usb device..
Hmmm… This actually looks a lot thicker than paper and duller than a razor, and Apple doesn’t actually design most of its products. All that being said, this is probably the best integrated small form factor desktop available today. 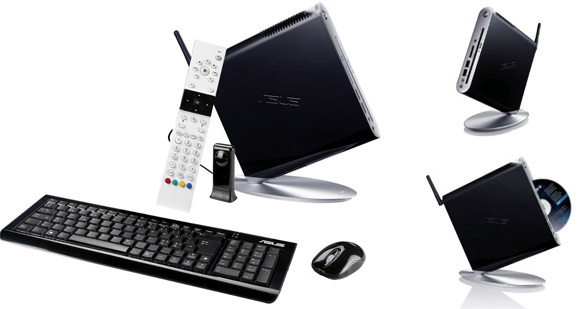 One nettop left out of this review is the Asus Eee Box EB1021. It’s got the AMD Fusion 1.6 GHz APU with Radeon HD 6310 graphics, so it should be great for HD 1080p video. Also has 2 USB 3.0, 4 USB 2.0, HDMI, VGA, WiFi N, Gigabit LAN, 2 GB DDR3 1333 RAM (4 GB max), and 320 GB HD. I’ve just ordered one for $379 from Amazon. That makes it pretty competitive with anything else listed in this review. If you don’t need an optical drive, this is a very good choice. Just picked up the new all in one shuttle slim XS35V3.Very impressed with this little computer.The new version comes with a intel Atom D2700 2.13GHZ chip 4G of memory 500GB HD DVD drive wireless 1Gig network card a HDMI port and lots of USB ports. I loaded win 7 32 and its a great system.Hard drive is a bit slow at 5400 rpm but it does everything I need it to.The best thing is with a 40 watt monitor the system on draws 55 watts.In sleep mode 4 watts.If your after a low power saving silent mini PC this is a great unit,I paid $367 dosnt come with OS.And will only run on win 7 32 bit. “customize your computer to your own licking”?? That is just so wrong.